There are several traditional ingredients that many cultures serve to help ring in the new year. Lentils are one of them, signifying prosperity. They are inexpensive, plentiful and nutritionally can’t be beat. Lentils have have been part of the human diet since the the Neolithic era, being one of the first crops domesticated in the Near East. Archeological evidence shows they were eaten 9,500 to 13,000 years ago. When purchasing lentils you want to have a good look at them. If they are not in open bins, make sure you are seeing the lentils through clear plastic packaging. The colors should be bright and uniform. Dull looking lentils are a sure sign of old age. Just before cooking give them a little rinse under cool water to wash away any dust or sediment they may have attracted. 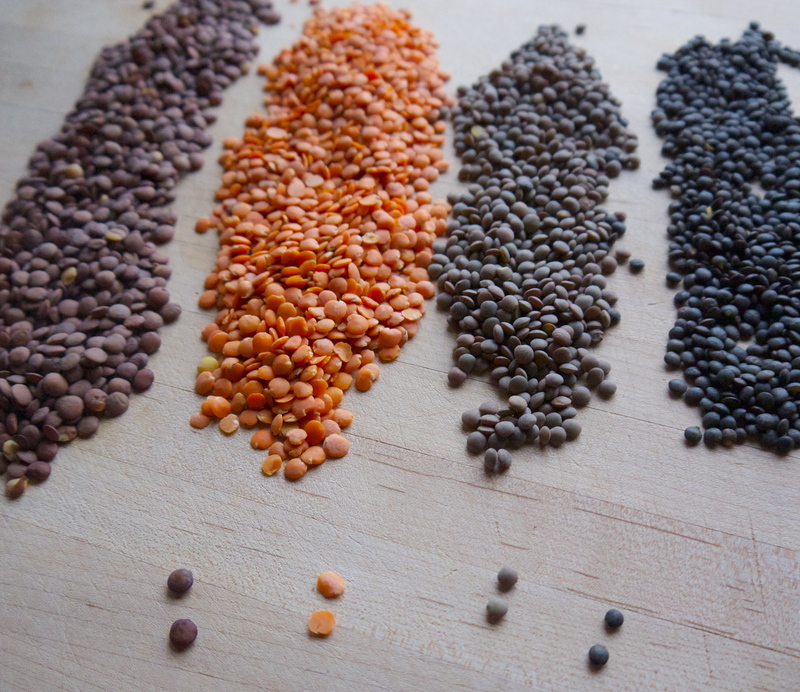 Lentils range in color from yellow to black and varying degrees in size. I pretty much like all varieties, but would have to pick the black ones as my favorite. They hold up the best in shape and are simply divine in salads. Cooking lentils could not be easier. Presoaking is not necessary. Simply boil in the liquid of your choice, water or stock, with a ratio of 1.5 cups of liquid to 1 cup of lentils. Red and yellow lentils will cook up a little faster than their siblings green, brown or black. Last year, around this time, I wrote another story about lentils and shared with you two easy recipes. Click this link: Seasonal Chef Cooking with Lentils to read that story. This year I have two new recipes to share with you. There are basically two ways to enjoy lentils: pureed and whole. Pureed lentils can be super thick and served under a protein or vegetable similar to soft polenta. My favorite way to enjoy pureed lentils is in a soup. 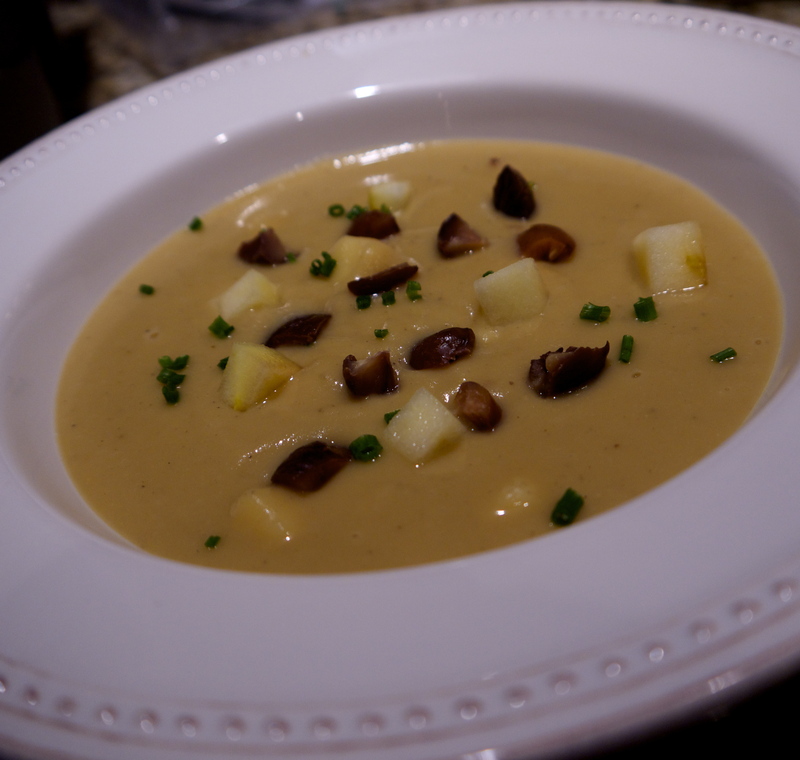 Combining a few warm spices, apples and chestnuts I created a delicious winter soup this week: Red Lentil, Apple and Chestnut Soup. This New Years Eve we decided to lay low, as my husband was getting over a bad cold. Being home, for the first time in many years on this festive holiday, and wanting to do something a little special, I made a traditional New Years Eve dish called Cotechino con Lenticche. Translated it means sausage and lentils. 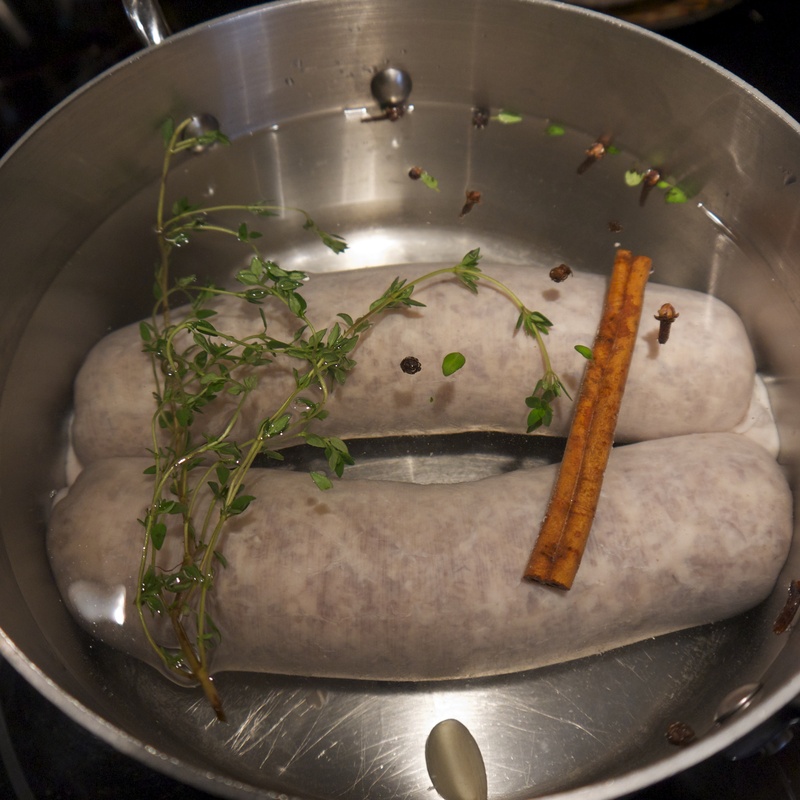 The sausage is a traditional recipe from Modena that is fresh and typically boiled. You can find it at most Italian markets that have a meat department. I happened to have picked up mine at Tarry Market, made by their very own sausage maker Noel DiMaggio. The lentils signify coins, or prosperity, and the pork signifies progress. Both great attributes to have in the new year. The dish is relatively easy to prepare, but of course I put my own twist on things. 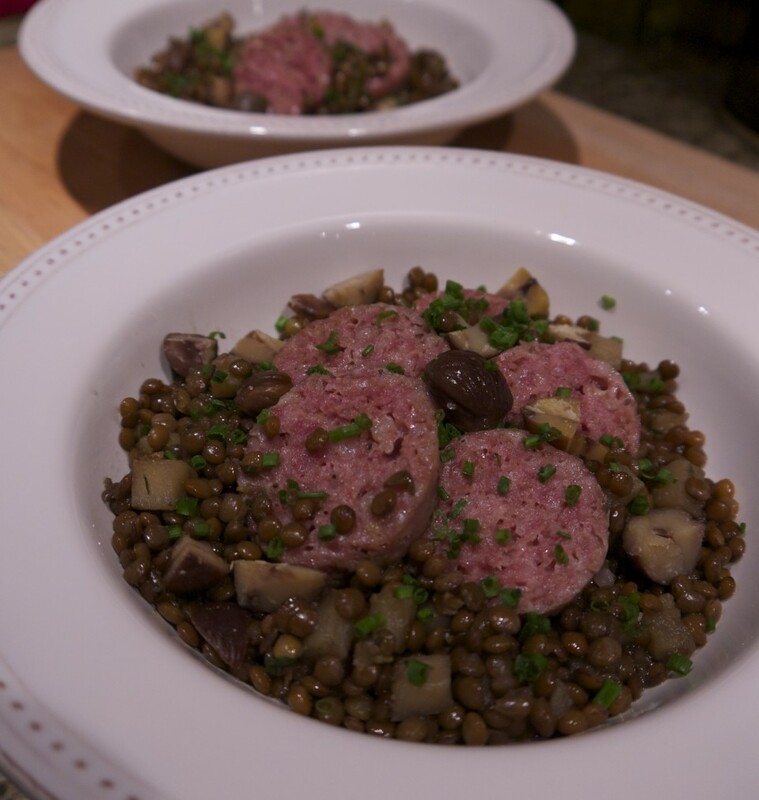 Click this link to see my recipe for Cotechino con Lenticchie. What ever your tradition for the new year make it the best you can. January 1 is a clean slate, the opportunity to start over and begin anew. I’ve never been one to make “resolutions” as they generally are forgotten by February 1. So I prefer to just promise myself to eat a little better, exercise a little more and work hard to come up with some new and creative recipes for you to enjoy. If you find yourself out and about this coming Saturday stop by the Pleasantville Farmers Market. I will be there making my Red Lentil Soup using the wonderful spices from Spice Revolution. Stop by for a taste! Felice Anno Nuovo e Buon Appetito!